Vigorously whisk all INGREDIENTS together in a medium bowl until well combined. Cover and chill for at least a few hours, but preferably overnight. Start with one wonton wrapper, brush it with water (you can just use your finger like below too if you don’t have this really cool brush), and place another wrapper directly on top of it. Press down on it firmly all over so they stick together. Then slice your cheese into small cubes. I put 4-5 cubes (about 1 oz) in each wonton. Dip your pointer finger in water, and brush the outside edges with water. Take opposite corners of the wonton and bring them together. Pinch tightly and repeat with the other two opposite corners. Make sure the seams are firmly pinched together (really… make sure they’re stuck together well) and then place the whole wonton into your hand and gently squeeze out any excess air. Check to make sure there are no holes, pockets, or loose seams in the wonton wrapper, as the cheese will melt out! Repeat this process with as many wontons as you’d like. Now you’re going to grab a saucepan (I don’t suggest using a frying pan for this, it’s too messy and dangerous) and place about an inch worth of vegetable oil in it on medium high heat until it’s 325 degrees Fahrenheit. I use a candy thermometer to make sure I stay in the 325-350 range. Place your wonton(s) carefully in the hot oil and cook until golden brown. The cooking time will vary depending on how many you’re cooking at once. It took me about a minute for two wontons, and we flipped them about half way through. Tipping the pan, so the oil can fully submerge the wonton helps to cook them faster, and you don’t have to flip them! You’ll be able to tell when they’re ready, just look for a nice golden color! I would suggest testing one at a time, until you feel comfortable on the amount of time it takes to get a golden, crunchy outside, with a gooey cheese center! Also, make sure you’re keeping an eye on the oil temperature, because you may need to adjust the heat level as you’re going to maintain 325 degree F oil. 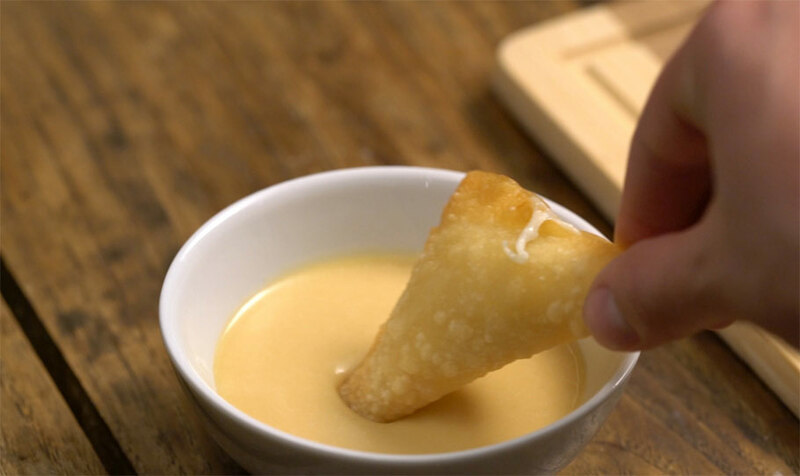 After the wontons are done, place on a paper towel to drain excess oil and serve immediately with that really awesome honey mustard that’s been waiting in the fridge.